Fantasy Mass Transit - A Technology Too Far? 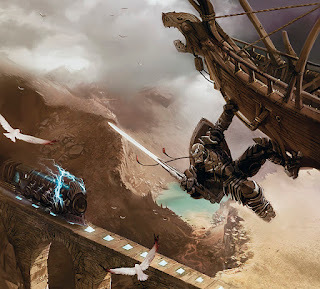 In his recent article, The Architect DM: Seven Wonders of Your World, Danny Rupp highlights the Lightning Rail from the Eberron setting as an example of a World Wonder. As I was largely ignorant of the detail of the Eberron setting I did a little more research and was both intrigued and horrified in equal measure by this concept. As I've written before, in a quasi-medieval fantasy setting personal mobility is generally restricted to a couple of days walk and even those who own horses don't tend to travel long distances unless they have a pressing need. Long arduous journeys or quests to find this artifact or that magical location are the stock-in-trade of the fantasy novel and it is often the journey itself, not the final destination that defines the hero. In Charlie Jane Ander's round-up of the 10 worst mistakes that Alternate History Authors Make, author Terry Bisson states that "if you don't bring your alternate history up to the reader's present, then you leave out half the fun". Whilst I agree that this often the case with Sci-Fi and especially with the alternate history subgenre, it is not the case with fantasy literature. In fact introducing some relatively mudane modern day solutions into a medieval setting can have disastrous effects. Although attractive as both a plot generator and as a mechanism for swiftly moving PCs from one location to the next, a system like The Lightning Rail (even if access to it is heavily controlled) opens up a whole new can of worms in that it also ushers in an age of mass transit in the same way that the real railways did in the 1830s. With mass transit comes huge socio-economic upheaval as people inevitably migrate towards cities and goods suddenly become cheaper as transport costs are reduced. Consequently cities will gradually expand in size, usurping nearby land which no longer needs to be used as farm land because produce can be brought in just as cheaply from further afield. This is just the start. As always there is the "exception that proves the rule" and in this case it would be a setting which has suffered some form of technological regression. There are often pieces of working ancient technology to which access is heavily controlled and the knowledge of its operation is usually forbidden by some form of techno-priesthood and the population will often rationalise this as being magical or divine. Orson Scott Card's Memory of Earth features an Artificial Intelligence (which the population call the Oversoul) which uses mind control to prohibit access to ideas which will ultimately lead to the development of self destructive technologies. In this way he allows access to things like electricity and magnetism but avoids the wheel and the industrial revolution arguing that they ultimately lead to the development of war machines. In his novel Cat Karina, Michael G Coney uses a sail driven monorail concept, which utilises the remnants of technology left behind by a previous human civilisation. A religious belief system prohibits the use of manufacturing and power systems which would ultimately lead to the development of faster, better "trains" and stems the onset of any transport revolution that might ensue. 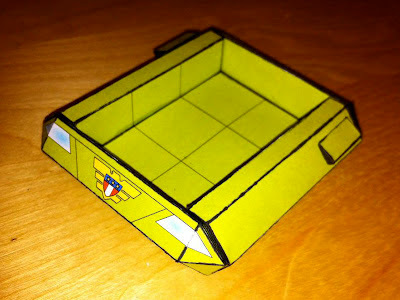 It's been a couple of weeks since I posted anything as I've been busy papercrafting again. 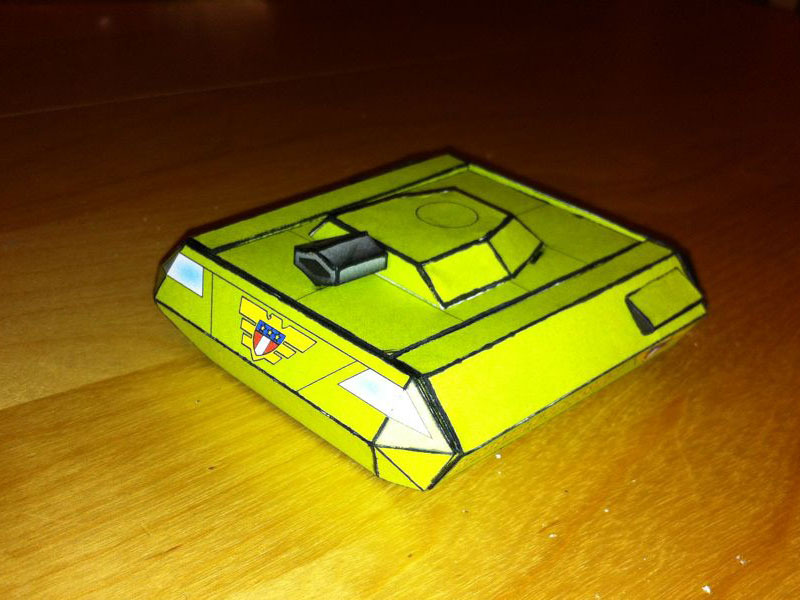 In honour of the 35th Anniversary of Judge Dredd, here's some photos of the prototype H-Wagon (and Riot Tank variant) I've designed for my upcoming Judge Dredd game. 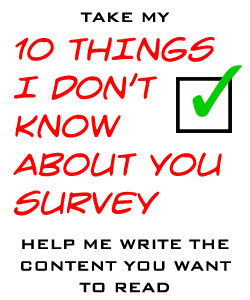 You can also download a really big version from 4shared. I am definitely of the 2nd Age of D&D, I cut my teeth on 2nd Edition AD&D and my favourite campaign setting is Al-Quadim (precisely because it is the most alien campaign world to most players). I was a late adopter of 3/3.5 and for me it didn't have the same hold on me as 2nd Edition (for all its failings). I have played a demo of 4e and am unlikely to buy it given that D&D Next is on the horizon. The lifespans of D&D editions have become shorter, whether or not this is as a result of commercial pressure, is hard to say as there is evidence to suggest that D&D has always had more editions with shorter lifespans than AD&D and that it has only become noticeable since the 3/3.5 reformation. In fact I was mostly ignorant of the "Basic" D&D versions for many of my formative years, as my go-to game was AD&D. More new campaign settings were published during the Second Age than any other and this may account for the slightly longer timescales between editions but also coincides with the Golden Age of Roleplaying, the 1980s. Dragon and Dungeon Magazine have been my stalwart companions along this journey, more so than any "edition" of D&D, and I have taken ideas from their pages and converted them to work in many systems and genres over the years. D&D as a brand has been "managed" for a longer period of time than it was by its creators. It is bigger than any one person or team and it will most likely outlive us all (in some form). I wish Mike Mearls, Monte Cooke and all the other people at WotC the best of luck in what is arguably a truly Sisyphean task and I can say I am excited about the future of D&D under their guardianship. Version 2 of my Ages of D&D timeline. When you can't google an image sometimes you have to make it. In the late eighties Tim Child, a Journalist/Reporter/Producer for Anglia TV, came up with an idea for a kids TV show having been inspired by the popular 8 bit dungeon questing games such as Atic Atac and Dragontorc. 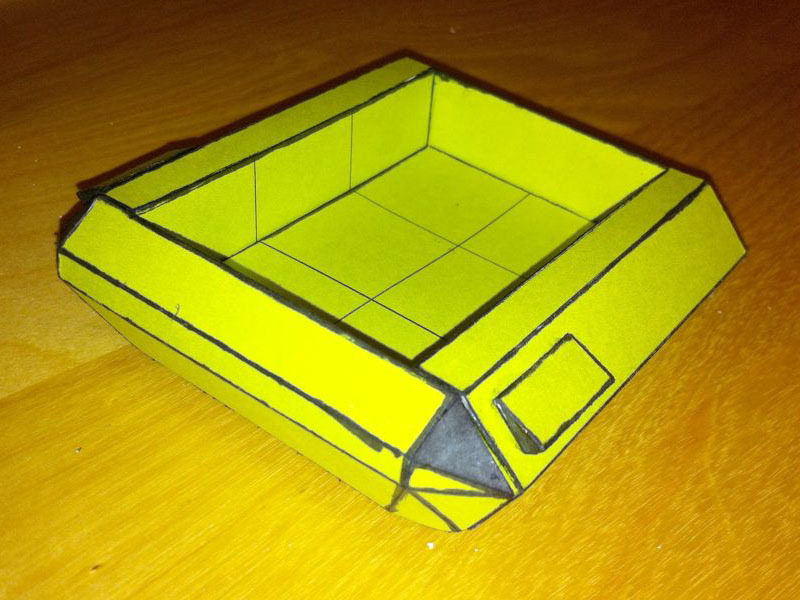 The concept was simple, a team of four children would embark on a quest to retrieve an artifact from the dungeon. One child played as the "dungeoneer" and wore the "helmet of justice" effectively blinding them (to the primitive TV technology available at the time) whilst the remaining three acted as guides watching the action through a "magic mirror" and telling the dungeoneer where to move and what to do. 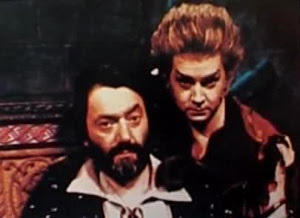 The guardian of the dungeon was a character called Treguard (played by Hugo Myatt) who would act as Dungeon Master, giving the players clues as they progressed through the dungeon rooms. Other characters would appear in rooms to offer clues to the completion of puzzle or give the players a riddle which might help in the next room. In later series some of these characters like Pickle (played by David Learner, who also wore the Marvin suit in the BBCs Hitchikers Guide to The Galaxy) became permanent fixtures. Often players would be required to cast spells in order to defeat a puzzle, these consisted of the dungeoneer spelling out a word. I was never sure whether this mechanism was deployed due to the limitations of the technology or as an educational content element to pass the TV commissioners scrutiny. The technology was definitely a limiting factor with regards combat and the producers eschewed the opportunity to add a roleplaying element with the dungeoneers always being known by their real names. In essence the show was essentially a puzzle solving exercise and although there was some inspiration to be got from viewing in hindsight it was pretty limited, but nevertheless a fun show to watch. 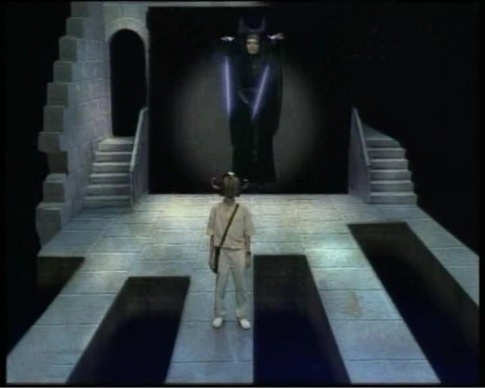 The show used the chromakey tecchnology to superimose the "real" world onto the digitised matte paintings of the "virtual" dungeon, the work of airbrush artist David Rowe who had painted a few of the more popular 8bit game covers of the early 80s. It wasn't long after the show's debut that the first of six gamebooks were released, between 1998 and 1993, in an interesting part novella part gamebook format. The obligatory TV boardgame was released by MB in 1991 and seems lack lustre and pedestrian by comparison to other earlier MB adventure games such as Heroquest both incidentally designed by Stephen Baker. Although I look back at this early attempt at an immersive TV show through rose tinted nostalgia glasses, it's hard not to be impressed with what they achieved. 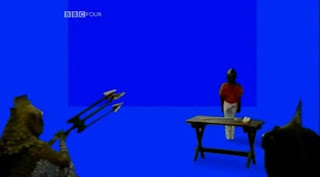 An attempt at a CGI reboot (known as Knightmare VR) was attempted with a pilot in the early 00s, but to date no channel has attempted this level of immersion in a mixed media environment. The BBC have come close with the creditable shows Trapped!, Raven and Mission 2110 which are essentially reworkings of the Crystal Maze physical challenge format with expensive sets. http://www.knightmare.com - An excellent fan site with indepth history of the show. Don't you just hate it when someone invents something with the best of intentions and all you can think about are it's potential evil uses. 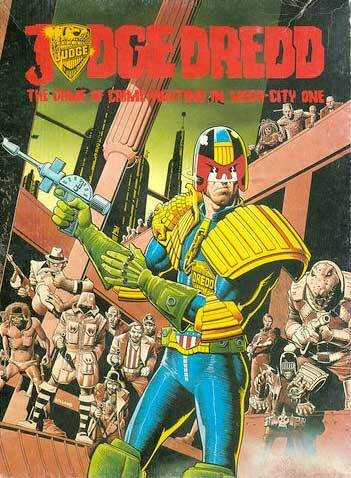 2000AD hit the newstands in 1977 and its most popular and longest running character, Judge Dredd debuted in Prog 2. The vision of writer John Wagner and artist Carlos Ezquerra, Dredd is a product of late 1970s pop culture, economic stagflation, and social and industrial upheaval. 22nd Century North America is largely a blasted radioactive wasteland known as The Cursed Earth, humanity has retreated to the safety of a handful of megatropolis known as Mega Cities. The traditional policing structures techniques have been replaced by a system of hardline law enforcers known as Judges who are a combination of policeman, judge, jury and executioner. 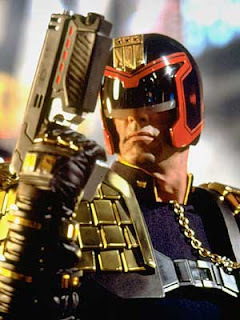 Judge Joseph Dredd is the epitomy of a Judge, a single minded human machine entirely dedicated to the task of upholding THE LAW. He is feared and respected in equal measure by his peers and the citizens of Mega-City One and is an example of the Anti-Hero character concept. A peculiar aspect of the character of Judge Dredd is that in an almost unbroken 35 year long run of comic book appearances, his face has never been shown. This gifts him an almost mythical "Everyman" aspect, which coupled with his status as a clone (via a policy of state sponsored genetic experimentation), reinforces the man/machine idea and that he is more a product of his environment rather than humanity. In the 80s Ian Livingstone designed the Judge Dredd boardgame to fit in with its expanding range of bookshelf boardgames. Essentially, a cluedo style race around Mega-City One to find and arrest a random collection of perps who were busy commiting random crimes in random locations. 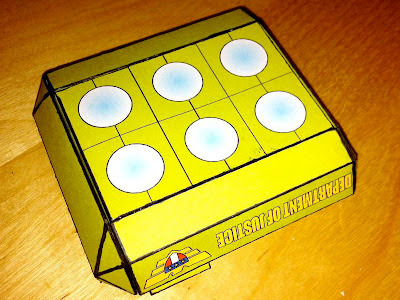 Each of the perps were famous faces from the comic escapades of Judge Dredd and had a "Perp Rating" which coupled with the severity or "Crime Rating" of the crime they were committing gave a target number you had to roll against with a pair of d6. The artwork came straight out of the pages of 2000AD and the board (by Ian Gibson) was a glorious piece of artwork in its own right. Brian Bolland's cover pretty much sums up this very simplistic game, but lots of fun could be had trying to arrest the The Dark Judges for littering or The Angel Gang for Umpty Bagging even though these perp/crime combinations could be a bit bizarre. This wasn't the last we'd hear from Games Workshop with 2000AD inspired games and they followed up with Block Mania (and its expansion Mega Mania) and Rogue Trooper. I never got round to buying these with my meagre schoolboy resources but they are on my ebay/thrift store wish list. In 1985 Games Workshop released Judge Dredd RPG written by Rick Priestley (Warhammer, WH40K, Warmaster) and Marc Gascoigne (Blood Bowl, Chainsaw Warrior). As a fan of 2000AD it was almost inevitable that It would become one of my favourite systems and it holds the rare distinction that it's only system which I've bought twice! and still own both copies. Opening the box reveals 2 books; The Judges Manual (a Players Guide), the self explanatory Game Masters Book, a double sided map to the scenario contained in the gm guide (one side is a meg-way underpass the other a shaggy hall) and a sheet of cardstock counters and standees with a good mix of judges, perps and bystanders. The game system is very simple being based on two stats STRENGTH (2-4) and INITIATIVE (Percentile) and 6 percentile skills; COMBAT SKILL (CS), DRIVE SKILL (DS), TECHNICAL SKILL (TS), STREET SKILL (SS), MEDICAL SKILL (MS) and PSI SKILL (PS). The majority of roll playing is resolved through a simple percentile skill check (with modifiers dictated by the GM). 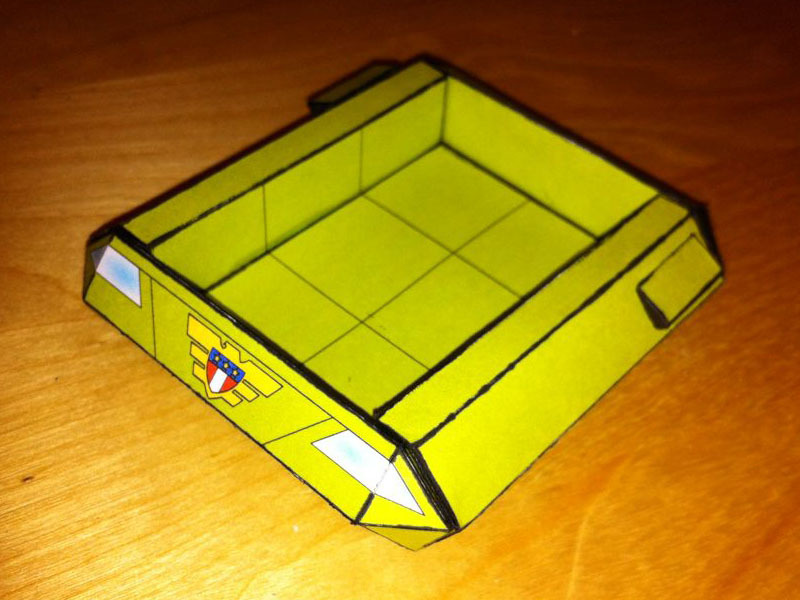 A Combat Round consists of 10 Phases (or Frames) and a character's INITIATIVE dictates how many actions they may make and in which phases, fans of Steve Jackson's CAR WARS will immediately feel at home. Combat damage results in either STUNS (which temporarily reduce INITIATIVE) or WOUNDS (which temporarily reduce STRENGTH). The full range of Justice Department specialisms can be replicated through this 6 skill system but the majority of PCs will most likely be Street Judges. Once a PC has a score of 40+ in any skill (and for every full 10 points thereafter) they may choose a Special Ability offering bonuses to completing actions or for us in certain situations in much the same way as D&D Feats. 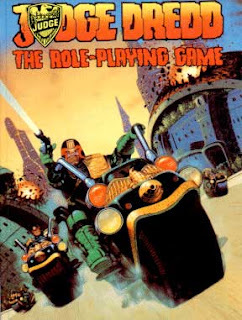 The rules light nature means that a session of Judge Dredd is fast paced with the focus on action (just like the comic books), although there is plenty of opportunity through the skills system to have a more detective style game. A healthy mix of rounding up perps and then trying to decipher the clues left behind in their aftermath is usually the best way to go. Games Workshop supported the system with the hardback Judge Dredd Companion, a compilation of White Dwarf articles, two campaigns Judgement Day and Slaughter Margin, the excellent Citi-Block floorplans and a 200 figure strong range of miniatures. "perhaps that was one of the failings of the first film; they tried to do too much and ended up with not a lot." 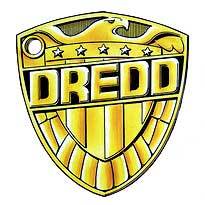 In 2002 Judge Dredd was acquired by Mongoose who rebooted the RPG system using the D20 system. Although I have never GM'd or played this version, I do own some of the scenarios and supplements, which are eminently useable and are the usual high quality Mongoose products. Mongoose were acquired by Rebellion Developments (who had bought 2000AD from IPC Magazines in 2000, coincdence???) and in 2009 they replaced the D20 System with its own Traveller System and also produced a set of free rules for mass combat in support of its excellent range of 28mm Judge Dredd Miniatures. March 2012 sees the 35th Anniversary of Judge Dredd and a new movie starring Keith Urban is released in September. I hope to mark this resurgence of interest in my favourite comic book character by running a game with my Friday gaming group, writing more Judge Dredd blog posts and possibly releasing a PDF or two.